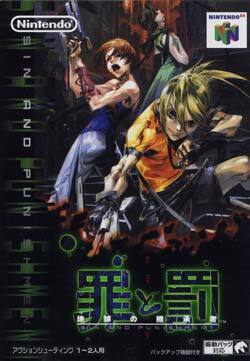 Sin and Punishment: Successor of the Earth (罪と罰～地球の継承者～, Tsumi to Batsu ~Chikyū no Keishōsha~?) is a rail shooter for the Nintendo 64. Originally released only in Japan, it was released internationally in 2007 as part of the Wii Virtual Console's Hanabi festival for 1200 points. The Virtual Console version includes a complete translation of the game menus and training mode, but the in-game dialogue subtitles remain in Japanese, due to the original voice acting being in English. The game is set in an apocalyptic future in Japan. Mankind's prosperity has led to a vast population increase and serious food shortages. In an attempt to solve the food shortage problem, scientists create a new species to use for food, and place the herd in northern Japan. In time, the creatures mutate and attack the people of Japan. An international peacekeeping organization called the Armed Volunteers tries to stop the creatures, now referred to as "ruffians", but they also oppress the Japanese. Another group, referring to itself as the Savior Group, and led by a mysterious woman named Achi, rises up to defend Japan against the Ruffians and Armed Volunteers. The game begins in Tokyo with Achi, Airan, and Saki embarking on a mission to steal an Armed Volunteer transport. This page was last edited on 3 September 2015, at 01:48. This page has been accessed 9,428 times.